Do you ever get frustrated dealing with a lot of clutter around the house? I’ve been through the same dilemma! And because of my busy schedule, I don’t have much time to keep things in place. At first, I was afraid to keep my belongings outdoors as I feared they might get stolen. But when I heard about a plastic storage that’s safe even for outdoors, I became intrigued and decided to try it out. Ever since I purchased my Keter Store It Out Max, it felt like a breath of fresh air and I can now enjoy a lot of space in my house. Keter is a brand from Israel that manufactures high-quality household and garden products. They use a hard plastic called resin in creating their products. The company has been around for 60 years and they have achieved many awards since then. Thanks to their excellent quality products! Resin is a heavy-duty plastic that’s moulded into different things, including garden sheds. But even though it’s made out of plastic, it claims to be long-lasting and weather-resistant. The [amazon link=”B00H27JWLW” title=”Keter Store It Out Max” /] is amongst the brand’s Store It Out family which comes in different sizes. This particular garden shed measures 145.5 x 82 x 125 cm which falls in the middle of its siblings. While the smallest variant is the Keter Store It Out MIDI and the biggest among them is the Keter Store It Out Ultra. This can provide storage for up to 1,200 kg and it has wide opening doors for easier access inside. If you’re looking for a garden shed that isn’t bulky and easy-to-transport from one place to another, then this one is a shed you should consider. 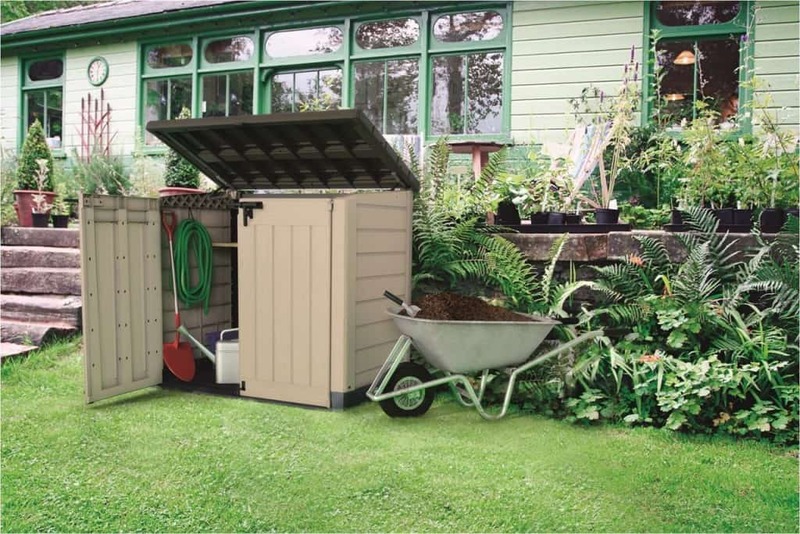 The Keter Store It Out Max garden storage is ideal for your garden tools, lawnmowers, toys and other equipment. It measures 132 x 76 x 110 cm (L x W x H) when assembled on the inside, meaning there’s enough space to keep your belongings. 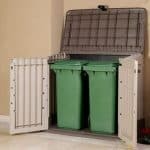 It can hold up to two 63g wheelie bins if you don’t want them being exposed and being in the view of passers-by. You can store a maximum of 1,200 kg inside the Keter Store It Out Max and that’s just the right amount needed if you’re looking for one that’s medium sized. This garden shed, although made from plastic, can last a long time. Since it doesn’t require any maintenance and doesn’t form rust, it’s actually a very convenient item of furniture to add to your home. The only thing you need to be careful about is hitting it hard with one of your garden tools. But since the Keter Store It Out Max has wide doors and supported with a hydraulic-piston on its lid, you can safely store your things without harming the product. This garden shed provides a dry and well-ventilated storage unit that’s also weather-resistant. The Keter Store It Out Max garden shed can protect your things, rain or shine. The resin is a material that can be moulded into different shapes and integrated with different colours. The Keter Store It Out Max almost looks like a wooden shed because of its brown and beige tones. It won’t ruin the overall appearance of your garden because it’s made to blend in with its neutral colour. 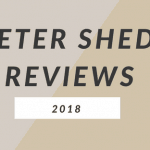 The Keter Store It Out Max garden shed has a sloped threshold and two wide-opening doors that make storing heavy items easier when you don’t have anyone to accompany you. Keter made sure that it would be hard to break into your garden shed by integrating two front locks into the Store It Out Max because they integrated two locks for security. One’s on the main doors and the other on the foot of the shed which is a “Step on Lock”. This ensures that your things are safe inside the shed even when it sits in your garden. Before I purchased my own Keter Store It Out Max, I wanted to make sure I was making the right choice. And as with any practical buyer, I read different reviews and it made me even more excited to order the product. 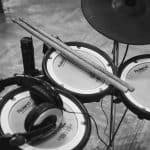 Recent reviews are the most important thing for me before I buy any product online as I want to know if the quality of the product has remained over time. 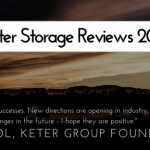 For the Keter Store It Out Max, reviews seemed impressive up until the past year. It’s a very durable item just like the Keter Store It Out Max since the company uses the same material for its products. It has a decorative touch that even kids will like. Additionally, it has wheels integrated for easier transportation around your garden. The Waltons Wooden Tongue & Groove Garden Storage is large enough to store hose pipes, plant pots, watering cans and foldable outdoor furniture. It’s made with high-quality timber that promises a 10 Year Anti-Rot Guarantee. This garden storage is integrated with 12mm Shiplap Tongue and Groove Cladding and a roof felt cover for extra coverage. 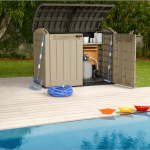 This is an outdoor storage unit made from a plastic material called weatherproof polypropylene. It’s also an ideal shed for those who only have a limited space in their garden. The Clifford James Plastic Garden Storage Box Chest Container has a 240-litre capacity that keeps your things secure and dry all day, even outdoors. It has a lift up lid to easily access the inside of the storage. This garden shed won’t need any maintenance to keep it from wearing out just like the Keter Store It Out Max. Upon purchasing my own [amazon link=”B00H27JWLW” title=”Keter Store It Out Max” /], I immediately assembled it and it didn’t take much more than an hour to assemble it by myself. I’m able to store even more than just my belongings inside as I still have more space inside the shed! This shed is very convenient for those who want something that requires zero maintenance and will surely last. But that’s as long as it’s not being hit too hard. It’s durable enough for kids to play with. But be careful when they try to reach out for the garden tools inside! – Wood is the most widely used material for garden sheds as it can add an aesthetic feel to the garden. It gives a traditional look to your garden whilst also functioning as storage for items such as your garden furniture and gardening tools. Wooden sheds need to be treated at least once a year by wood paint or through preservation to help prevent them from wearing out. – Plastic garden sheds are a more recent type of shed as were discovered to be effective and require minimal maintenance. It’s very convenient for household owners as they are lightweight and are therefore easier to assemble than other materials. – Metal sheds tend to be ideal if you need one that can stand amidst bad weather conditions. They don’t need to be treated for preservation, just a quick wash to keep it clean will do. The size of the shed you’re going to purchase largely depends on two things: your available space and what it is you’re going to store inside. If you intend to use your shed for keeping some garden materials, then a small shed should be good enough for you. However, you’ll a larger garden shed if you’re going to store heavy equipment, large garden furniture or use it for a building project. Keep in mind that your shed shouldn’t occupy all the space in your garden because you need to walk around it when it needs some cleaning and maintenance. Also, consider how much room it would use once you open the doors as it might exceed your available space. There are unlimited possibilities when it comes to utilising a garden shed. Aside from storing garden tools, bigger sheds can also be used for crafting, a workshop or even a playhouse for the kids. Garden sheds come in different sizes, shapes and made of different materials. Plastic sheds can be the most budget-friendly on the market but it all depends on how you’re going to use it. For instance, storing heavy equipment and valuable materials in it isn’t advisable. Buying the right shed that satisfies your needs is definitely a worthwhile investment so it’s best to take note of these points before choosing one. I found the [amazon link=”B00H27JWLW” title=”Keter Store It Out Max” /] to be the most appropriate shed for me because I only need enough storage to keep all my clutter in one area.